The Children Act 2004 requires each Local Authority to establish a Local Safeguarding Children Board (LSCB). The LSCB is the key statutory mechanism for agreeing how the relevant organisations in each area will co-operate to safeguard and promote the welfare of the children within the Authority, and for ensuring the effectiveness of what they do. For further more detailed information, please refer to Chapter 3 of Working Together to Safeguard Children 2018 and the Local Safeguarding Children Boards Regulations 2006. To ensure the effectiveness of what is done by each person or body for that purpose. The scope of LSCB role includes safeguarding and promoting the welfare of children in three broad areas of activity. 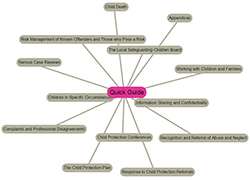 Regulation 5 (2) which relates to the LSCB Serious Case Reviews function and regulation 6 which relates to the LSCB Child Death functions are covered in chapter 4 of the guidance. An LSCB may also engage in any other activity that facilitates, or is conducive to, the achievement of its objective. Hold their organisation to account and hold others to account. The governor or director of any prison in the local authority area which ordinarily detains children. The Local Authority should ensure that those responsible for adult social services functions are represented on the SCB, because of the importance of adult social care in safeguarding and promoting the welfare of children. Similarly health organisations should ensure that adult health services and in particular adult mental health and adult disability services are represented on the SCB. The Local Authority should also secure the involvement of other relevant local organisations and the NSPCC where a representative is made available. In addition, two representatives of the local community should be appointed as full LSCB members (their role is described in Working Together 2018) and the LSCB must also appoint representation from schools. This means taking steps to ensure that the following are represented: the governing body of a maintained school; the proprietor of a non-maintained special school; the proprietor of a city technology college, a city college for the technology of the arts or an Academy; and the governing body of a further education institution the main site of which is situated in the authority's area. Independent schools should also be included as appropriate. LSCBs should engage with faith groups, children's centres, GPs, independent healthcare organisations, and voluntary and community sector organisations including bodies providing specialist care to children with severe disabilities and complex health needs. In areas where they have significant local activity, the armed forces (in relation both to the families of Service men and women and those personnel that are under the age of 18), UK Visas and Immigration (formerly UK Border Agency) should also be included. Where the number or size of similar organisations precludes individual representation on the LSCB, for example in the case of schools or voluntary youth bodies, the Local Authority should seek to involve then through existing networks or forums, or by encouraging and developing suitable networks or forums to facilitate communication between organisations and with the LSCB. The LSCB also need to draw on the work key national organisations and liaise with them where necessary, for example the Child Exploitation and Online Protection Centre. It is important that safeguarding and promoting the welfare of children is seen as part of the wider context of the Children's Trust and that the LSCB's policies, guidance and procedures such as these, reflect and contribute to the wider goals of improving the wellbeing of all children. The LSCB complements the role of the Children's Trust Board and the LSCB should be represented on the Children's Trust Board although the two bodies should be chaired by different people. The Children's Trust Board - drawing on support and challenge from the LSCB - will ensure that the Children and Young People's Plan reflects the strengths and weaknesses of safeguarding arrangements and practices in the area and what more needs to be done by each partner to improve safeguarding and promotion of welfare. The LSCB is a formal consultee during the development of the Children and Young People's Plan. Media interest in Child Abuse. This page is correct as printed on Tuesday 23rd of April 2019 03:14:34 PM please refer back to this website (https://sussexchildprotection.procedures.org.uk) for updates.